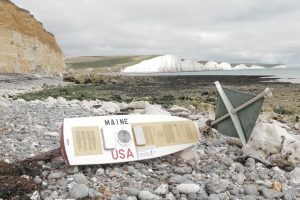 The Red Storm was thought to be launched by the Maine Maritime Academy sometime in 2016, but without its GPS receiver. Then, in the spring of 2018, it was confirmed that the boat was still on the ship! For whatever reason, it was not deployed. 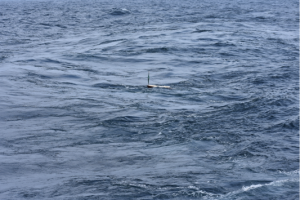 Voyage 3: 92 days at sea (5/16/18 – 8/18/18) traveling over 6,735 km. Finally, the 3rd voyage of the Red Storm began on May 14, 2018. 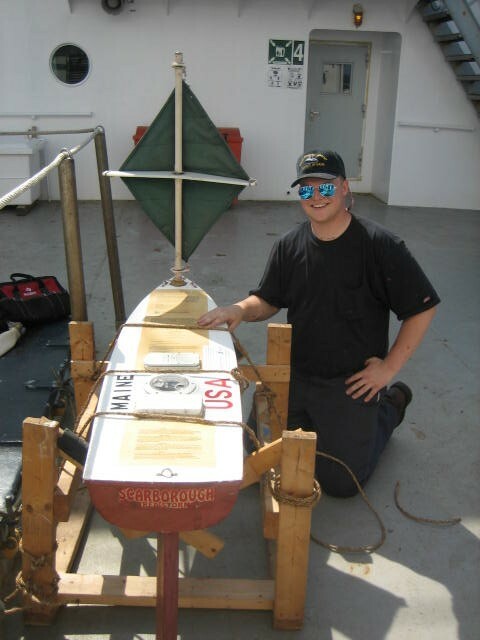 Deployed off the training ship the State of Maine on their voyage to Spain by Chief Mate Brendan McAvoy (pictured to the right). Follow the cruise blog at https://mainemaritime.edu/tssom-training-cruise-blog/. The clouds have returned…but we are still making strong headway across the Atlantic Ocean and are one day closer to our first port of call – Cadiz, Spain. Last night we enjoyed a gorgeous sunset relaxing on the 04 weather deck and fantail. Despite the lack of sunshine, it is still very warm and humid outside the skin of the ship. Today we mixed up the daily routine a bit and launched a school sponsored project that researches the effects of wind and current. The craft, Red Storm, sponsored by the Scarborough School District was cast adrift at approximately 1430 local time (~1630Z / Greenwich Mean Time) in position Latitude: 38-45.3N / Longitude: 047-26.6W. We wish her a bon voyage. You can track Red Storm’s progress at http://educationalpassages.org/boats/redstorm/. A few months later, the Red Storm made a close approach to the French coast. 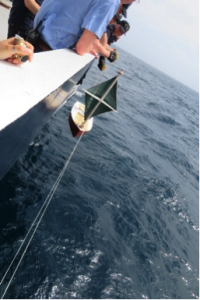 An email alerted our colleagues at IFERMER and elsewhere of the potential landfall but, the following day, the little vessel veered north towards the coast of England. 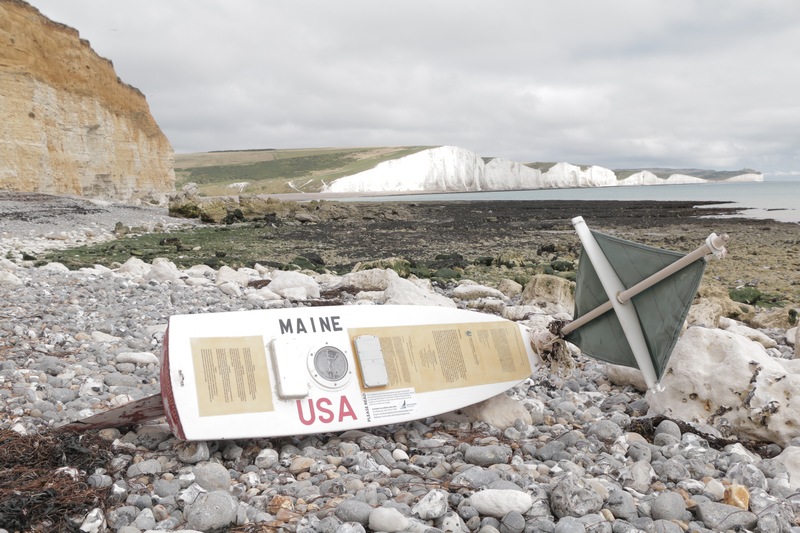 After heading up the English Channel for another week, she finally came ashore in Sussex, England near the Seaford Head Nature Reserve. Unfortunately, this is a section of the coast filled with high cliffs and, while we contacted the reserve hours after landing, we are not sure if a rescue will be possible before the following tide. With Nikki and others involved, it looks like the Red Storm is in good hands and is about to enter the classroom once again and get ready for another adventure in its long multi-legged voyage. 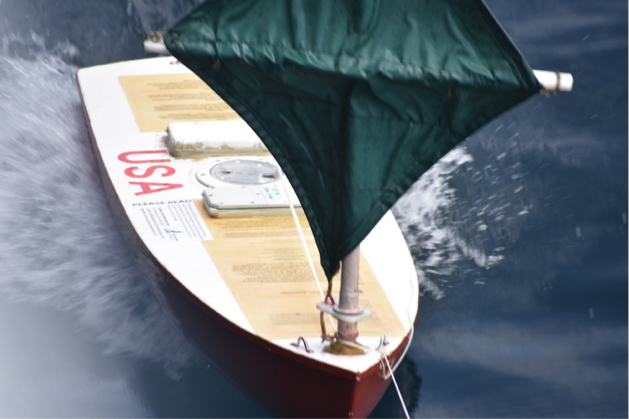 Back home in Maine, the little boat is making news. 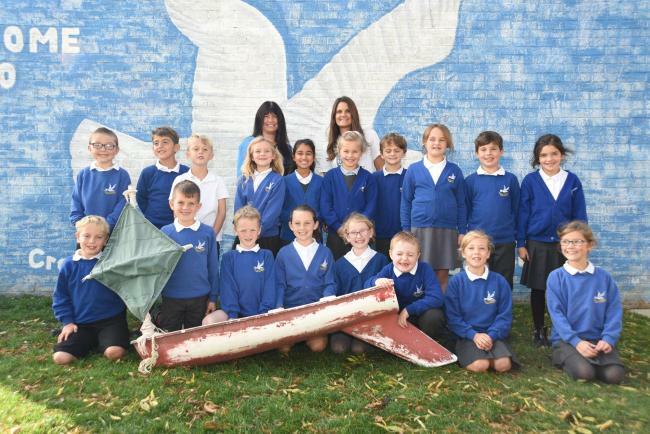 Andrea Keith, Head Teacher of Cradle Hill Community Primary School (back row left) and Nikki Hills, (back row right) with year three pupils and the Red Storm miniboat. 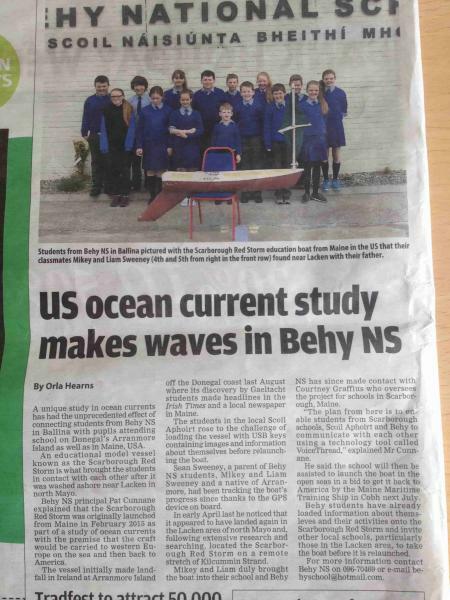 The Red Storm is now at the Cradle Hill Community Primary School in Sussex and was featured in the Argus. Red Storm was put back to sea and next made landfall in Lacken, Co. Mayo where it was located by two pupils from our school (Mikey and Liam Sweeney) and their father (Sean). 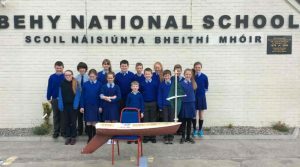 Sean Sweeney, a parent from our school community, had heard about the boat when visiting his native Arranmore and had been tracking its progress. He noticed that it had appeared to come to land again around Lacken. He and his sons, Mikey and Liam, searched Kilcummin Strand on Saturday, 2 April but to no avail. They checked the satellite again that night and narrowed the location down to a stretch of beach that appeared difficult to access. They located a right of way on Google Maps that would lead them down to that beach and headed off the next morning to try again. Sure enough, they found Scarborough Red Storm. A copy of our recent film festival. Our school has a strong interest in film-making and recently held our fifth film festival. The films shown are on the DVD as well as some clips from films made by our Film Club over the last 5 years. The films were shot on the school grounds and all around this locality so would give anyone interested some insight into where we live. Some stories about our school and area by 6th class children. Some photos of the school and area. A copy of our Children’s Proclamation. This year was a special year in Ireland, the 100th anniversary of the 1916 Rising, which was a major event on our road to independence. The leaders of the Rising created a Proclamation, declaring the kind of Ireland they would like to live in. Schools were invited to create their own similar proclamations as part of the commemorations and that is what we have included. A newspaper clipping from The Western People about Scarborough Red Storm landing in Lacken. 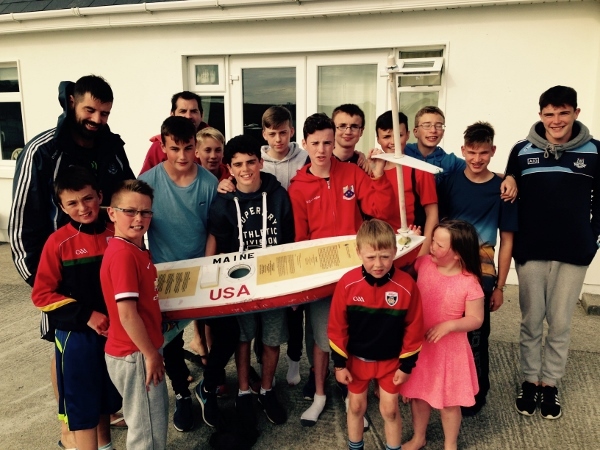 A picture of Mikey & Liam Sweeney with Mikey’s classmates. 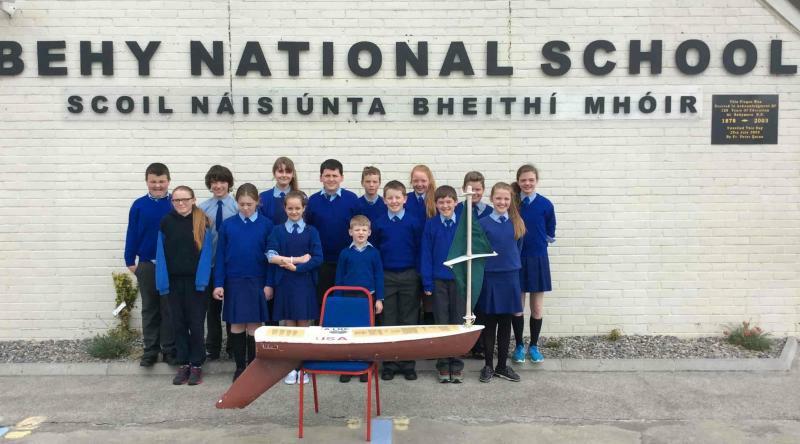 Patrick Cunnane, a teacher at Behy National School, is organizing sending Red Storm to Cobh, Co. Cork, Ireland where it will be relaunched by The Maine Maritime Training Ship. For more information about Behy National School, please visit their website. Scarborough Maine’s “Red Storm” was deployed on 6 Feb 2015 off Georges Bank by lobstermen on the F/V Gladys Elaine. 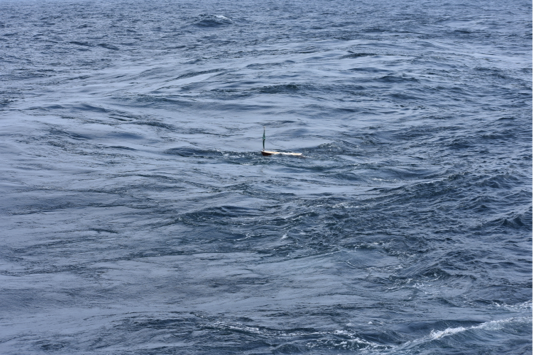 It is shown below in calm seas, a test run prior to deployment. 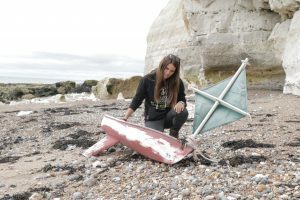 Courtney Graffius’s students hope she’ll make it across the ocean! 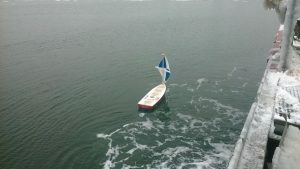 On 31 July 2015, less than six months after getting underway, she landed on the island of Arranmore on the northwest corner of Ireland! She was found by an Irish Language summer College with students ranging from 11 to 17 years. They had come to Arranmore Island from all over Ireland to improve their Gaelic, spoken Irish. We got a photo sent to us by Noel Gaughran showing a lot of Irish smiles. He notes that the boat will next visit the local public school when it opens in the Fall and plans are underway to relaunch. A few weeks later, articles appeared in both the Irish Times (includes a video of the students dancing around the boat) and in the local Scarborough Maine paper (includes a photo of the students in Maine).